Beginning with the assassination in l983 of the popular opposition leader Senator Benigno (Ninoy) Aquino, the movement against Marcos grew rapidly. Imprisoned for seven years by Marcos, Aquino had experienced a deep conversion in his concentrated study of the Bible and Gandhi. 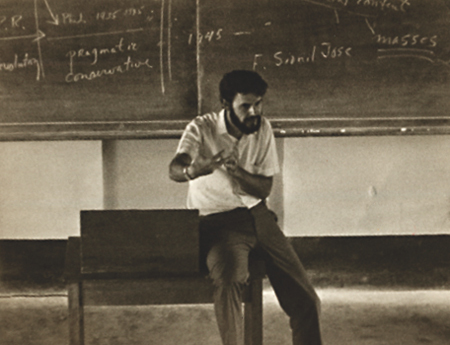 This led him to begin advocating a nonviolent revolution against dictatorship. His subsequent martyrdom fueled the determination of many Filipinos to continue in his radical nonviolent path. I felt a strong affinity with this emerging movement. I had taught social ethics at Union Theological Seminary in the Philippines for thirteen years. Coming from the southern US where I was part of the civil rights struggle, the parallels with the Philippine situation were strong: Martin Luther King, Jr., the leading spokesman of the nonviolent movement against entrenched injustice had also been killed but his message and approach lived on. 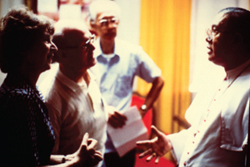 In 1984, the Little Sisters of Jesus, a community of nuns who worked among the poorest of the poor in metropolitan Manila, took it upon themselves to contact Jean and Hildegard Goss-Mayr, nonviolence lecturers and trainers in Europe who had worked for many years for the International Fellowship of Reconciliation (IFOR) in situations of revolution and war. The nuns asked the Goss-Mayrs, a French-Austrian couple, to come to the Philippines to help assess the situation. Having lived under Nazism in World War II, they were acquainted with struggling against tyranny. They came and met with church leaders (the country is over ninety percent Christian), peasants, labor and student leaders and community organizers. Out of these meetings came the decision to build a nonviolent movement that would oppose the dictatorship. They called their movement “people power,” demonstrating in an amazing way the power of active nonviolence, the power of truth and love. Also a part of the IFOR and having lived and worked in the Philippines, I joined in this campaign. 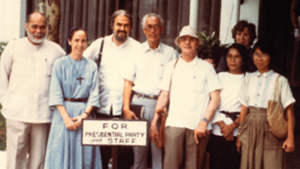 Long active in anti-war efforts and the civil rights movement, I returned to the Philippines and joined in the nonviolence trainings, accompanied by Stefan Merken, Jewish pacifist, photographer and writer also active in the IFOR. 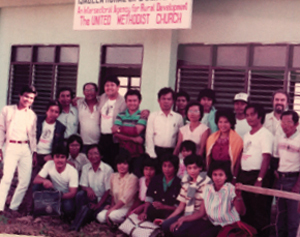 Our training team consisted of myself, Merken and Professor Hilario Gomez and six students from Union Seminary who were part of an activist group, FOJ— Friends of Jesus. Our efforts spread over a wide swath of Luzon, the main island of the Philippines. We traveled by public bus from place to place where our workshops were held: in local churches, a rural life center, a college, a labor center and at the headquarters of the National Council of Churches. Due to dictatorial rule in the country, we tried to keep “under the radar” so as not to be arrested should the content of our workshops become known to the government. The trainings were for invited persons only and were not publicly announced or noticed. After an opening worship, with hymns and prayers, at each workshop Gomez presented a socio/political analysis of the country-the Filipinos called such a lecture a “situationer.” Then Gomez and I talked about the nonviolent understanding of biblical faith that pursues justice, that stands with the oppressed and that challenges cruel authority as was seen in the biblical prophets, in Jesus, in the Asian Gandhi and the African-American King. Long active in anti-war efforts and the civil rights movement, I returned to the Philippines and joined in the nonviolence trainings. We did role plays, where participants would take assigned parts, such as a tenant farmer dealing with an oppressive landlord, or a worker stopped by an armed soldier for questioning. We talked about “the pillars of oppression”, e.g., the army, the government, the upper class. Participants shared their opinions and experiences and began to feel strength that came from verbalizing and acting out internal struggles that often had been held in silence. Learning of what had happened in India, in the US and other places was a powerful incentive for action. Ordinary people had done extraordinary things creating a contagion out of which movements had been born. Merken fascinated the participants with his Jewish perspective on biblical nonviolence. Most of them in this Asian nation had never even met a Jew, much less heard a Jewish pacifist discuss the first recorded act of civil disobedience when a midwife disobeyed the king’s edict to kill Hebrew male babies by hiding the infant Moses in the bulrushes, thereby saving his life. 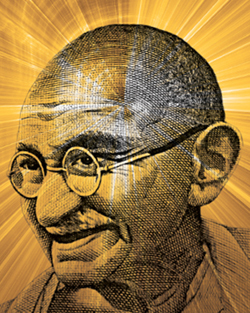 So nonviolent resistance wasn’t just a Gandhian idea! Learning of what had happened in India, in the US and other places was a powerful incentive for action. Ordinary people had done extraordinary things creating a contagion out of which movements had been born. We had lively discussions. There was universal disgust with dictatorship but some thought one just had to passively endure it. “Bahala na” they would say, a Filipino expression that means “That’s just the way things are, the way they will be.” Others thought only violence could be effective against evil oppressors. As a bishop said to me, “I used to believe in nonviolence but Marcos is too cruel; only a bloody revolution will work against him.” When I asked him how long such a revolution would take, he said, “Ten years.” (Neither of us had any idea, of course, that less than a year later Marcos would have fled the country when faced with nonviolent masses of Filipinos). Others refused to sanction violence even in a just struggle. Some had heard I worked for the CIA; others had heard I was really a communist! But some had heard that I was part of monthly vigils against the Vietnam War; others had been my students in seminary and had seen me at student demonstrations favoring democracy. The workshop became a safe place where these contradictory ideas and accusations were aired. Along with vigorous discussion were also moments of humor that joined us together in shared laughter. Through it all, the examination of Gandhi, King and Aquino led to an emerging understanding that, as Dr. King had said, “The arc of the universe is long but it bends towards justice.” Perhaps the time of reckoning was at hand. The martyrdom of Senator Aquino heightened the determination of the people to end their long tyranny. Maybe his death was a signpost, not another dead end. Neither of us had any idea, of course, that less than a year later Marcos would have fled the country when faced with nonviolent masses of Filipinos. The seeds planted in the workshops among Catholics, Protestants, Muslims and others of no particular faith; clergy and laity, intellectuals, students, peasant and labor leaders began to give birth to intensive efforts around the country to build a resistance community. Little by little, but also in unexpected leaps and bounds, there emerged a solid core of activists – including many key leaders – ready for a showdown with the Marcos dictatorship. The workshops of 1984 and 1985 were catalysts that awakened new possibilities into being. Age old habits of fatalism gave way to a determination for a better future. From cardinals and bishops to local priests and nuns, ministers and women deacons, brave students and farmers, a chorus rang out calling for change – dangerous and daring but absolutely necessary. Activists sprang into action, breathing new life into communities, forming new organizations, boldly speaking out about this “third way” – active nonviolence, the path between violence and passivity. I watched in awe at the creativity and boldness of “the unarmed forces” of the Philippines. Life is full of surprises and the unexpected occurred again and again. In late l985, Marcos called a snap election to show his critics that he wasn’t a dictator. A deeply divided opposition united behind Corazon (Cory) Aquino, the widow of the slain senator. She agreed to run against Marcos after one million Filipinos signed petitions supporting her. She went on retreat to think and pray before being willing to stand for election. In a signature yellow dress (Ninoy’s favorite color), she campaigned all over the islands to mammoth, enthusiastic crowds. Warned that her yellow dress made her an easy target, she said “When Ninoy died, I lost my fear.” T shirts, caps, banners, flags, even toilet paper – all in yellow – sprang up everywhere. When Marcos ridiculed her, saying she had no experience, she replied, “Marcos is right. I have no experience in killing, lying, robbing my country.” She turned out to be a born leader who won the hearts and minds of her countrymen and women. Despite fraud, intimidation and violence employed by Marcos, the Aquino forces brilliantly used a nonviolent strategy of marches, vigils, petitions, trained poll watchers and an independent polling commission. “Prayer Tents” sprang up where people came to rest and pray. These tents, places of discernment, were a project of AKKAPKA—a nonviolent group doing training all over the country. When Marcos tried to steal the election the country moved to the brink of civil war. Cardinal Jaime Sin, head of the Catholic Church in the nation, went on the radio and called the country to prayer and nonviolent resistance, truly a “revolution of love.” Those who were able were to come, unarmed, to support the resistance movement. He instructed the contemplative orders of nuns to pray and fast for the country’s deliverance from tyranny. The next morning Filipinos began arriving outside Camp Aguinaldo where the defecting troops had gathered. By noon there were 100,000 resisters; by 2:00 p.m., there were 250,000. Hundreds of thousands more arrived the next day. Despite fraud, intimidation and violence employed by Marcos, the Aquino forces brilliantly used a nonviolent strategy of marches, vigils, petitions, trained poll watchers and an independent polling commission. Thirty computer operators tabulating the election results, at risk to their very lives, walked out when they saw Marcos being falsely reported as winning; they knew it was a landslide for Cory. After first going into hiding, they met with the international press and publicly denounced the official counting, exposing the fraud to the world. Cory Aquino called for a nonviolent struggle of rallies, vigils and civil disobedience to undermine the fraudulent claim of Marcos that he had won the election. 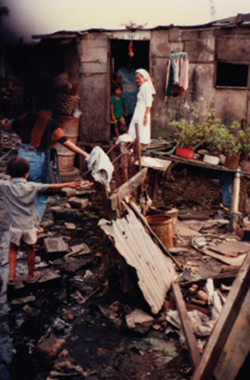 Manilla slum where non violence training organizes the people. Soldiers sent to put down the rebellion were met with flowers, sandwiches and candy and appeals to join the people, the citizens of a free Philippines. People even knelt in front of tanks coming to crush them (Perhaps that lone Chinese man standing in front of a column of tanks at Tiananmen Square had seen on TV what happened in Manila a few years before). When Marcos’ tanks came, the people locked their arms together five rows deep, facing the troops and the tanks. A Protestant pastor stressed how well organized the barricades were. He and some others from the workshops had learned about the example of the Czechs who in 1968 had faced down the Russian tanks. The Filipinos set up groups to check with each other and keep out infiltrators. Their plans were very simple: link your arms, drop down in case of attack, don’t run, and go in a deliberate manner. When tear gas was thrown, the first line would disperse to be replaced by those in the back. When they heard of stone throwing at the presidential palace some of the religious groups went there immediately to stop it. Facing the collapse of his support, Marcos, his family and an entourage of his inner circle fled the country. After two months of the contested election, the dictatorship fell in four days. Corazon Aquino peacefully assumed power. A Protestant pastor stressed how well organized the barricades were. He and some others from the workshops had learned about the example of the Czechs who in 1968 had faced down the Russian tanks. I was back home in Nyack, New York when these events, “the people power revolution,” occurred. I had been receiving some letters and reports although such news was sketchy in those pre-internet days. But as the movement grew and the coming election neared, there was increasing radio and television coverage. Nearby – across the Hudson River at Maryknoll – was a furloughed Irish Colombian priest, Niall O’Brien, with whom I had organized among the sugar cane workers in the southern Philippines. We met together often, shared news, talked by phone, prayed for the Filipino people in their struggle. I was on a speaking trip in Michigan when Marcos fled the Philippines. I took my transistor radio with me to hear all the breaking news. I began to be interviewed by the press but most reporters were incredulous to think a nonviolent overthrow had occurred; some suggested that the hand of Reagan or the CIA must have been at work. This was a teachable moment in which I explained the background and preparation for a new era in the Islands, based not on the power of the gun but on the power of the people: satyagraha, truth force. But even today, alas, many people are still pre- Gandhian in their thinking.